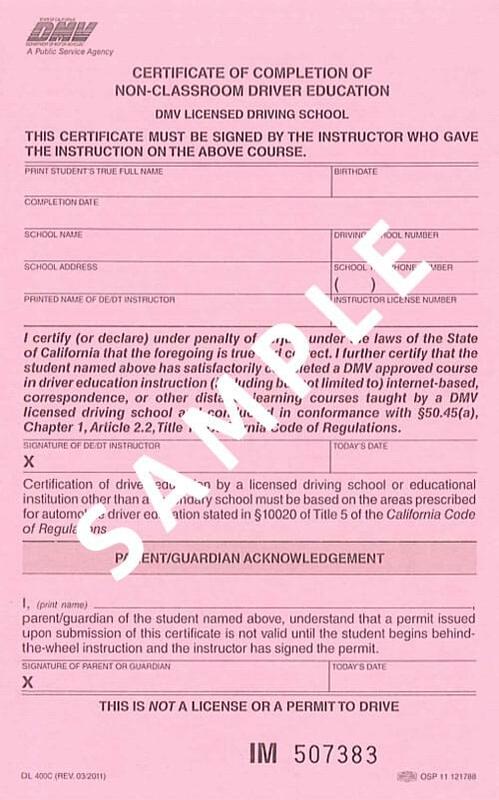 To get a California DMV Driving Permit, teens between the ages of 15½ and 17½ must complete approved driver education. This course is an internet-based, California DMV-approved driver education program and provides you the certificate you need to take to the DMV! To get started, select register now and you can begin the course right away. The California DMV allows teen drivers to apply for their provisional license at the age of 16. To do so, you must have completed driver education, have your driving permit (provisional permit) and completed behind the wheel training. View a dmv checklist that includes what you need to complete your driver license requirement, forms you need to take, and more. I enjoyed taking this drivers ed course. Very helpful with the module quizes and the practice test. Submitted 17 May 2018 by Kaydence N.
*American Safety Council — California Division, Inc. will provide a full refund within 60 days of registration if the student has not completed the online final examination. Copyright © , American Safety Council, Inc. All Rights Reserved. DMV License #E4608. "California Driver Ed Course" is a servicemark of American Safety Council — California Division, Inc.